Last year I opened a put trade against Ensco plc (ESV) stock. Back then, it looked like a no brainer trade. The trade provided a good premium and it seemed I would be out quickly. Since then the trade went south and I have a hard time to get out. Originally, I sold 11 strike puts. After a few weeks the stock went down and I let the puts assign. Since then the stock traded below $11 and there was only a short time window when it reached $12 again and, fortunately, I got rid the shares selling them. I should have closed my positions too. But that is all in the land of coulda, woulda, shoulda. I didn’t do it but rather decided to play this trade until the very end. And I kept rolling this trade and also adding calls. The credit received is nothing extra and the overall trade will most likely end with zeroes, but the main goal for this trade was to lower the puts down even if the credit will be insignificant. 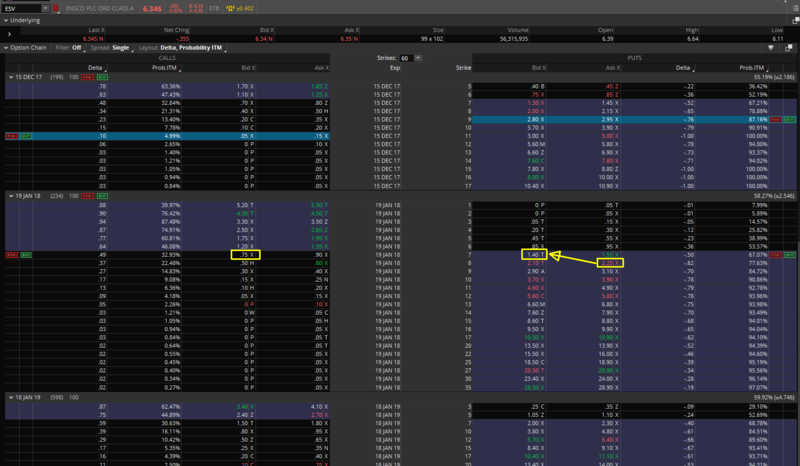 The other positive I see here is that I could keep the trade in January and we didn’t have to roll it into the next available expiration day which was January 2019 and that is something I didn’t want. Now we have a straddle and if the stock goes down or up I will roll it gain be it either puts down or calls up. We will see when we get there. Now it is a waiting time.